Bonnie (Pixel Dust Photo Art / Friday) this week asks "next week's 'challenge' will be to post a piece of photo art from your archives that never got the spotlight and attention it deserved" -- therefore... Since I am out-of-town, prepared and saved this as a draft; will do a link and post. You have created a moody, mysterious winter night, Karen. Thank you for showing us the layers that reveal the process you used. I like how much of the texture you removed. Sometimes I feel folks do not remove enough to do justice to their photograph. 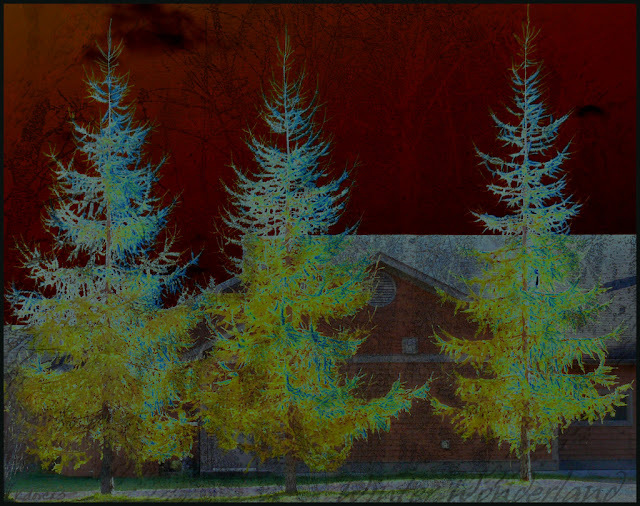 Thanks for sharing your work with Photo Art Friday! Wow, what a transformation. I love the resulting moody wintry scene. Those three identical trees [larches?] side by side amused me. Is this anywhere near where you live? And I like the way you have made them do a little dance. What a difference in mood and atmosphere your edit made! Such an interesting crop - I would have thought this was taken out in the wilderness but from the original it is just a neighborhood. Nice job Karen! Enjoy your travels. Hi Karen, what a great image. I am really loving your work! i can only second carole: it looks magical!! This turned out really special, Karen, wonderful Winter Wonderland ! That's quite a transformation, Karen! 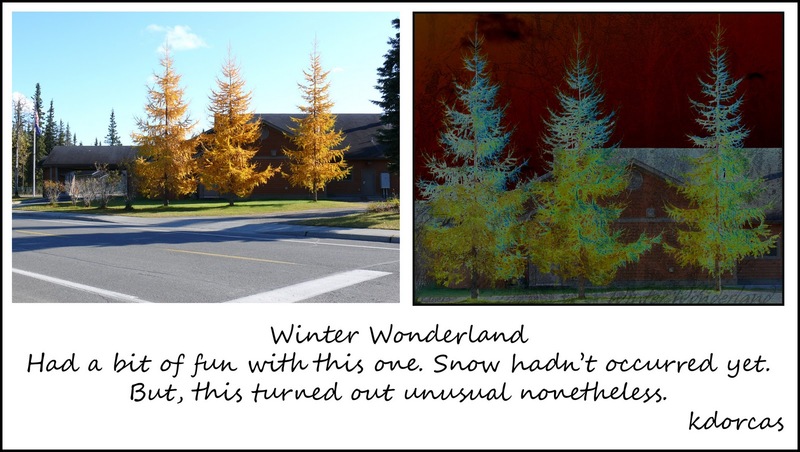 I think it is very interesting and fascinating how you turned a fall image into a winter wonderland - stunning! I love, love, love this effect! What a wonderful transformation. Very Christmas-y. Delightful edit. The textures did great things here. I so enjoy seeing everyone's photo art! This has such great texture and depth, I love it! That red sky is funky and interesting and the trees kind of take on an otherworldly look. A good example of how cropping can help focus attention! LOVE this Karen! I think exclusion is one of those edgy modes that completely transform an image! Bravo!